The combination of woman and affirmation equal a powerful force. The insights into the lives of 22 woman represented in the I Am Woman Enough book are the same insights that many women reading the book will walk away saying “I could have written the very words” of a particular story or maybe even a few of the stories. The authors allow us into their space to take a peek into the backdrops of their past. Some stories we would not want to wish on an enemy. Even with that being said, the real value of the book lies in the affirmations that the women share with us. As affirmations go we have to believe them first and continually feed (affirm) these truths into our being just like the 22 co-authors. They have adopted these valuable and positive truths and rightly so based on lessons of past experiences that were not in their best interest. But that is what life does right? : teach us lessons. Based on what they walked away with or from, some have been transformed, while others are still in the transformation process. 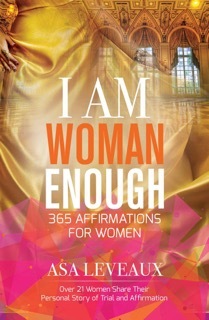 The affirmations in the I Am Woman Enough book are ones that can easily and realistically be adapted in the lives of the reader. Their story may be your story and according to co-author, Shewana Mack, that’s why she shared her story. Asa Leveaux has written several books on a number of topics including his recent “I AM MAN ENOUGH: 365 Affirmations For Men” which encourages men daily with notes, quotes and sayings that helps them put their lives into perspective. Asa also founded the Genius Academy which promotes personal success through the implementation of key strategies that are encouraged through inspiration and tactical execution. The Genius Academy is a resource and network for individuals who as entrepreneurs main goal is seeing their ideas through from fruition to success.